Hey Divi Nation, thanks for joining us for the next installment of our ongoing Divi Design Initiative; where each week we give away a brand new, free Divi Layout Pack (complete with gorgeous high quality images) from our design team to you. This week Kenny and his team have created a delightfully fresh design for anyone running a Farmers Market (or any non-profit/co-op, really). It consists of eight pages that anyone can use to quickly get up and running with all the essential pages and design elements their website needs, in just a few clicks! While there is a lot to like in this layout pack, we want to draw special attention to two pages: the Events page and the Donate page. 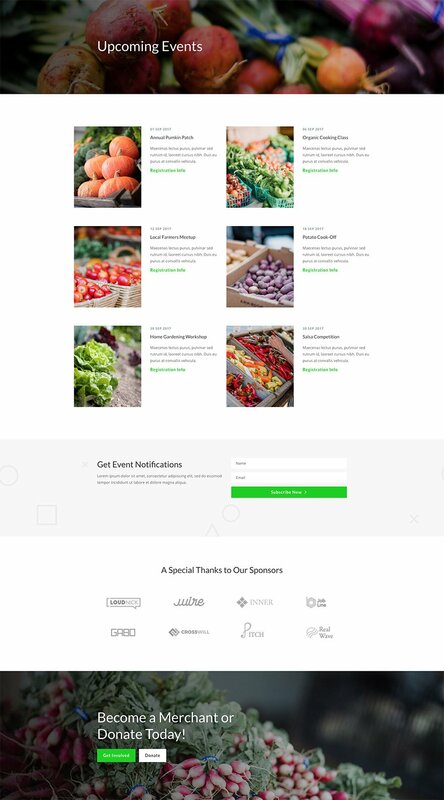 For any farmers market (or other non-profit) these pages will be essential to the health and ongoing success of the organization. We’ve provided an excellent custom events page and a donation page just waiting for you to add your donation form to. In fact, you’ll want to be sure to tune back in tomorrow and Wednesday for tutorials on how to get the most out of these pages! 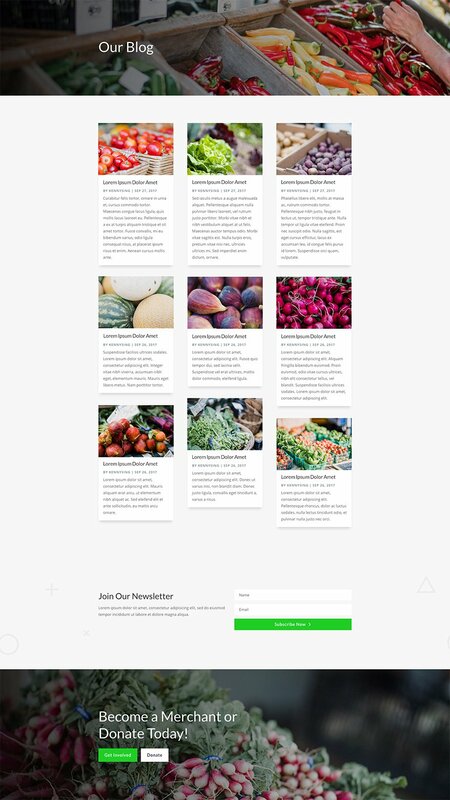 To use the Farmers Market Layout Pack on your own Divi website, you will first need to download it using the button below. To gain access to the download you will need to subscribe to our Divi Daily email list by using the form below. As a new subscriber you will receive even more Divi goodness and a free Divi Layout pack every Monday! If you’re already on the list, simply enter your email address below and click download. You will not be “resubscribed” or receive extra emails. Once you have downloaded the layout pack, locate the divi-farmers-market-layout-pack.zip file in your downloads folder on your computer. Double click the folder to unzip it and then navigate inside the divi-farmers-market-layout-pack folder. Inside this folder you will find 9 files, eight unique layouts that you can import into your Divi Library (one at a time) and 1 “all” file you can use to import all layouts at once. To do so, navigate in your WordPress Admin to Divi > Divi Library > Import & Export. 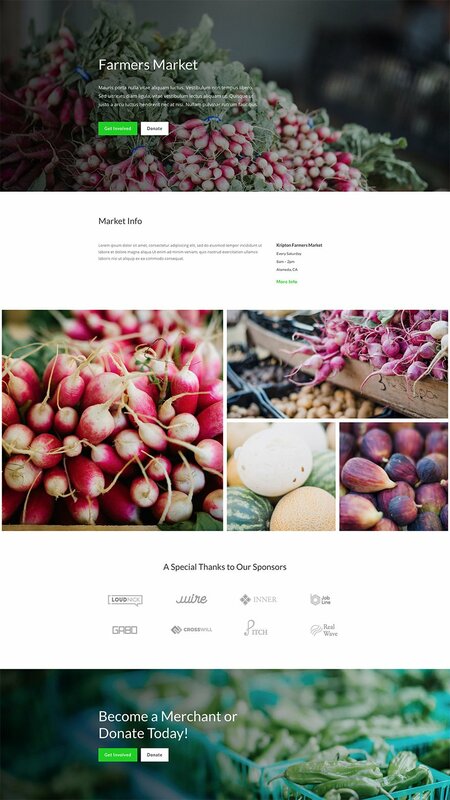 We hope you enjoy this free Farmers Market layout pack. And to help ensure that you do, we’ll be doing a live stream on our Facebook page and Youtube Channel this Tuesday at 3pm EST to walk through what it might be like to actually use this layout for your own website instead of simply importing it and loading it up. We’ll talk header and footer design, customizer settings, converting certain sections to global, and more. Will you be making any layouts for Web design agencies? 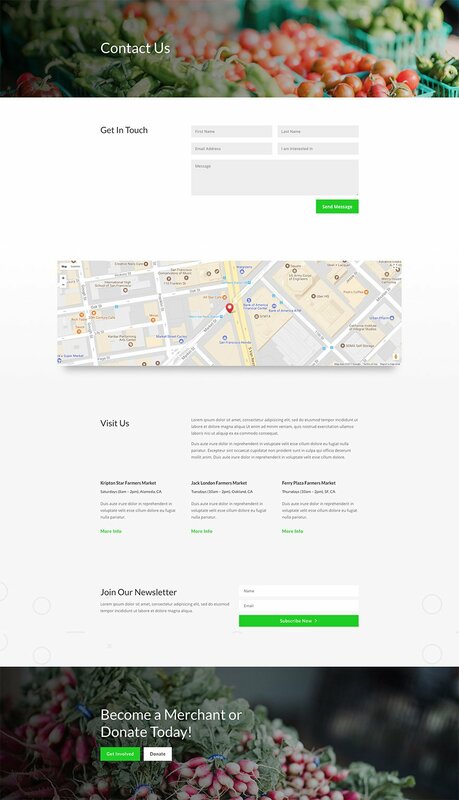 David, try the Divi layout for Design Agency. I’m thinking about using it but haven’t tried yet. Let me know what you think. Thank you so much for this layout. Please have a look at the images download link as it does not connect to the intended data. Sorry about that, it’s fixed now. Download away! For those not able to download the high resolution Images, the zip file has farmers spelled incorrectly. If you click on the link, then on the 404 page, change ‘farners’ to ‘farmers’, your download will work. Nice thanks. please fix images, link doesnt work. Link to image (https://www.elegantthemes.com/downloads/divi-farners-market-layout-pack-images.zip) give 404 error. There’s a typo in the image download link, its should be “farmers” not “farners.” Correct that in your address bar and the zip file downloads. Thanks for this great layout-pack. I can’t download the images just like Gerhard. Hope the link will work soon. Very small niche for this in 15 years never a client of this area. anyway is a great free layout thanks so much. That said would be great to have layouts for Coaches, freelancers, restaurants, web designers. But looking to your black friday stuff maybe this is in that package so thanks again elegant themes for providing value here. This layouts help us a lot for a good starting point in our next projects. Good week to all of you. This is fantastic – I specialize in making sites and online marketing for farms and I love this! Thank you soooooo much! I can’t wait to use it! Kathleen, that’s a great focus that I’m interested in. Do you have a website? What’s your interest regarding? Are you a farmer? Every Monday is brighter with your layouts. Keep ’em coming. Thanks! Wao! Thanks Elegant themes for this great freebie. Any plans to do a layout for Event Hire Locations. I haven’t found any great layouts for venues for hire (from stadiums to convention centers…). You are awesome! The layout packs are so great that I could almost cry. I cannot wait for the next one to arrive. Thank you for all the amazing layout pack, much appreciated. Is there any chance you could make a layout pack for a Make-up Artist? “Homecare” layout packs as after becoming a member, I cant find any. Super fresh guys, one of my favorites so far. So much love involved on this work! Wow! That makes my eyes shine! Thank you so much, Nathan, Elegant Themes! Amazing layout. I saw the module design I’ve been longing to create…oh mine, thanks a millions ET, you’ve made us modern designers! Are all the previous free downloads available on a different page to subscribers/members? Im still waiting for a modern photographer / photography modern layout pack . I really appreciate your work!! Please check your image link. I think not working. The same thing has happened to me. What I do? Off topic: Is that little chat goody on the bottom right of the page. a third party plugin or part of divi?